Hello, everybody! We continue to disclose the theme of Mortal Kombat, and our guest today – Johnny Cage! 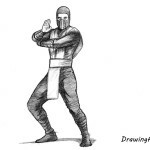 Johnny – one of the classic characters in Mortal Kombat universe, he was present in the very first game of the series, which was published back in 1992, along with such characters like Sub-Zero, Scorpion, Raiden and Liu Kang. By the way, the game was originally designed for video game machines, and only after some time it was adapted for home game consoles. 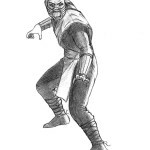 He went to the “Mortal Kombat” tournament only to assert himself and demonstrate to the public his high skills. Nevertheless, he is a warrior of light who fought on the side of Raiden to protect the inhabitants of the Earth kingdom – so let’s draw this old school character! The growth of man is approximately 7-8 heads. The torso is about 2 heads. And the length of the arms is about 3 heads. 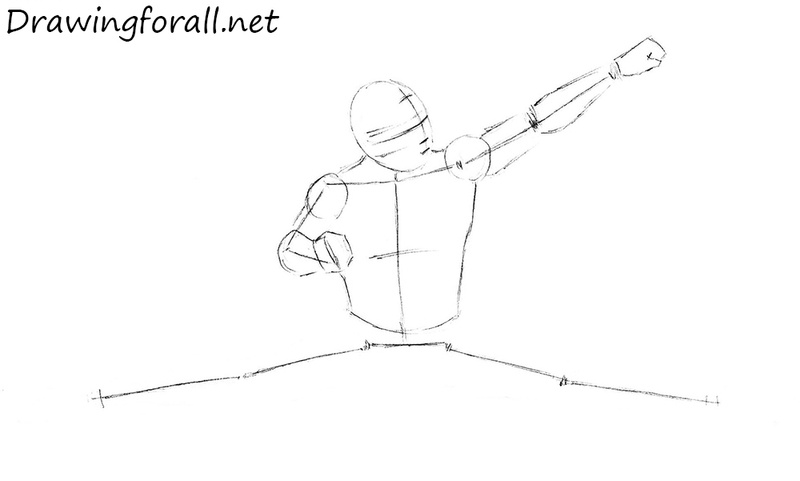 Do not be afraid of non-standard, dynamic posture of Johnny Cage – it is pretty simple to draw it. 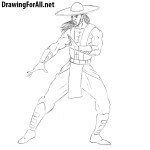 Continue drawing lesson on how to draw Johnny Cage. 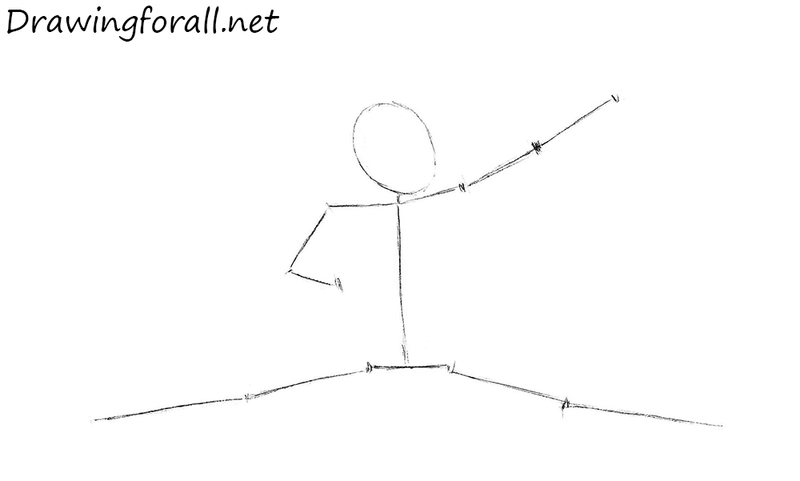 Check again your stickman, because it is very important to draw the stickman correctly. If you already convinced that the proportions are correct, we proceed to the second stage – we mark the face. First, draw a vertical axis of symmetry of the face and the horizontal line of the eyes. Above the line of the eyes draw the lines of the eyebrows and haircut. Below the line of the eyes draw the lines of the nose and mouth. Now we add the volume to the torso and arms. Use simple geometric shapes to create a kind of dummy. Outline the contours of the torso of Johnny Cage, that tapers to the waist. 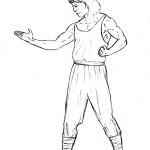 Using circles outline the shoulders, and using cylinders – arms. Draw the silhouettes of the fists. Note, that Johnny Cage must not be too much muscled, he should be athletically built, as Spider-Man. 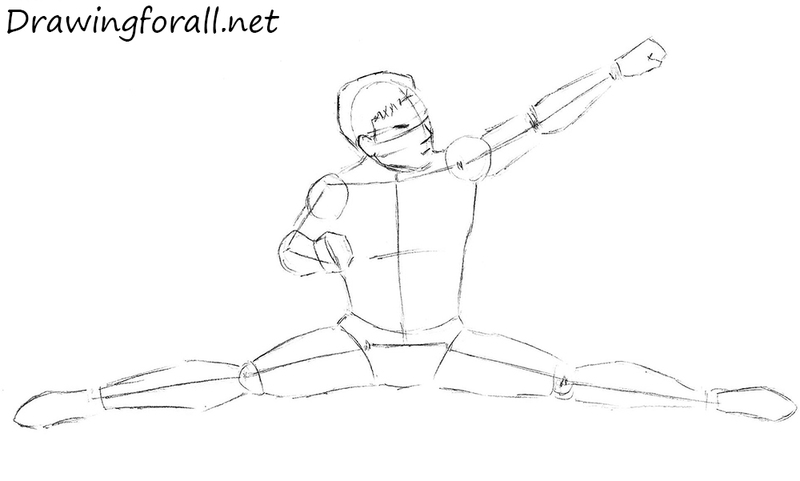 This step of the tutorial on how to draw Johnny Cage is not too complicated. 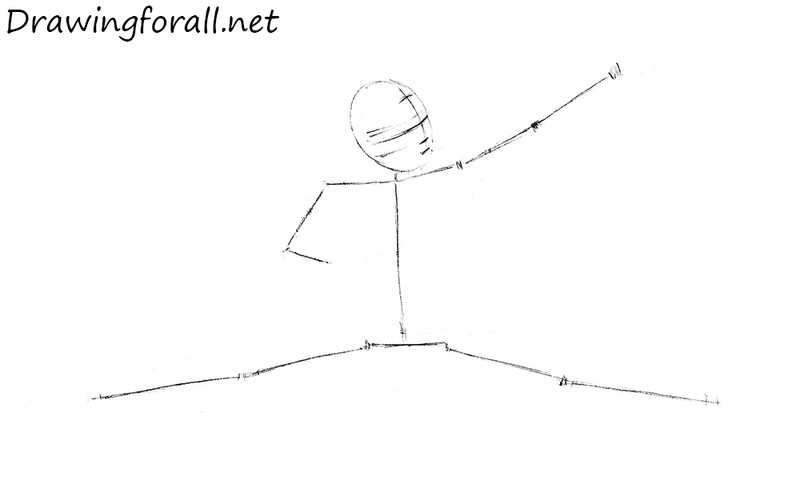 Draw the legs in shapes of modified cylinders and knees in shapes of circles. Silhouette is ready, let’s start adding details. the lower – on the same level with the tip of the nose. Let’s work on the face of Johnny Cage. If in the second and in the previous steps, you did everything correctly, this step will be very simple for you. Do not forget to mark the nasolabial folds and wrinkles – they give intense expression on his face, that happens at the time of sudden physical effort, in our case – punch. Draw the hair – lines should go in the direction of the hair from the roots to the tips. big pectorals on the chest. Draw the tightly clasped hands and feet. 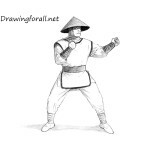 In this step of the drawing lesson on how to draw Johnny Cage we add details. Draw bracers with spikes. Draw belt tied in the knot on the side. Draw the lines of the shorts and shoes. In this step we add the final details to Johnny Cage. Erase the guidelines, draw we drew in the first steps. Circle the lines of the body, make lines smooth and clean. Add some strokes of muscles and some folds to the clothing. In this step we start adding shadows. First we need to determine the source of the light. Adjust the saturation of the shadows by using different pressure on a pencil and using hatching of different intensities. If these shadows seem too complicated for you, you need to learn how to draw shadows starting with easy lessons, such as lesson on how to draw grapes. It was a lesson in which we show you how to draw Johnny Cage. If you liked this drawing tutorial, please subscribe to our accounts in social networks such as Facebook, Google Plus, Instagram and etc.